Took the above photo atop Potluck Dome on the eastern side of the meadows. It's an easy walk up from Tioga Road. Park at the Potluck Dome trailhead on the south side of the road, walk five minutes on the trail -- it initially skirts the meadow to prevent damage to vegetation -- and then hop off the trail and then onto the dome at the first easy and obvious spot. And then walk up. It's not steep and the views are great, especially late in the day with the sun behind you. 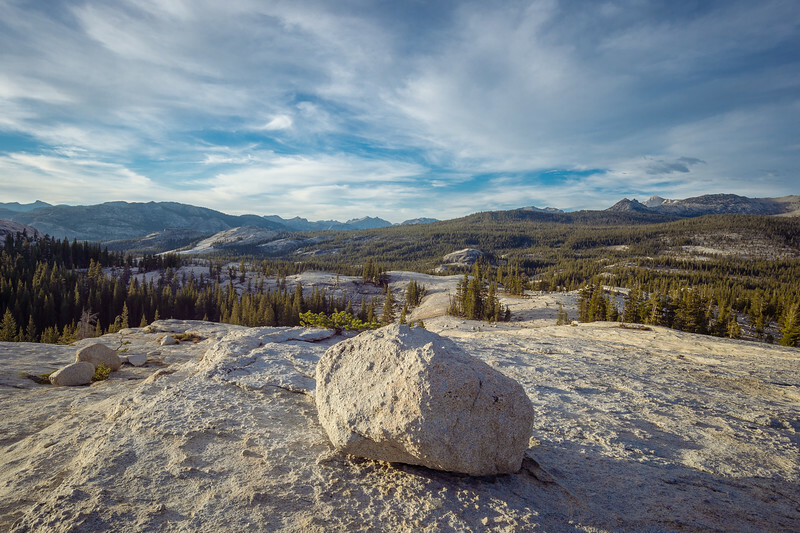 (note: there's also a shuttle bus that in summer that serves the Tuolumne Meadows area; it stops at the campground entrance/general store and at the Pothole Dome trailhead). I have a lot more photos but it's going to take some time to process. So I thought I would toss this one out first. I shot it with my Nikon Df and Nikon 18-35mm 3.5 lens. I used a nine-stop filter, which allowed me to keep the shutter open for five seconds to help give the sky that creamy cloud look. More of my work is on my main photo site -- including info on purchasing prints and licensing. Thanks for looking!